Take your packaging to the next level with our pull bows. 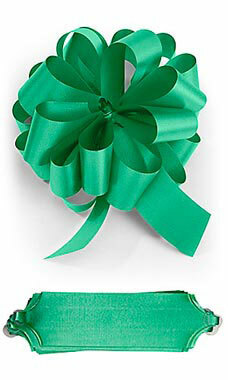 Our emerald green pull bows feature a shiny finish that coordinates well with our poly and curling ribbon. The pull bows are made of 100% Polypropylene. Our bows are conveniently sold in boxes of 50. Each are individually wrapped inside of a clear cellophane bag. Pull bows are ideal for all types of applications including packaging and crafts. All of our bows coordinate beautifully with our merchandise and gift bags. Learn more about How To Use Pull Bows in the Customer Connection section of our website!